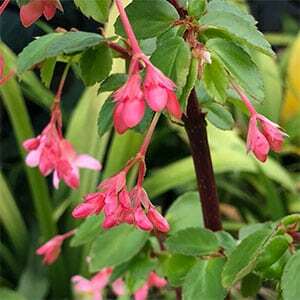 Easy care perennials are popular with many gardeners and Begonia fuchsiodes is one such plant. It will grow well a range of climates and is at home in good filtered light. It is a bit of misnomer that Begonias are not hardy, in many areas of Australia they are, and in fact Begonia fuchsiodes will survive outdoors in a Melbourne winter. This is also plant that is home as an indoor plant, given good filtered light and a good potting mix it with thrive and flower well as a houseplant. The following conditions will work well both indoors and outdoors. These are a deep rooted plant so dig the soil over well before planting to a good depth. A humus rich well drained soil or potting mix is essential. The best position is in good filtered light. Avoid direct sun through windows as this can create foliage burn. Water when the growing medium begins to dry. Never allow the soil to become soggy and wet. Use a general purpose slow release fertiliser when growing in containers and indoors. In warmer climates when growing in the garden use any organic type fertiliser. We like to fertilise this plant in spring and again in early summer. East from stem cuttings taken in late spring, and also possible by layering. You can also grow the plant from seed. It is also possible to divide the plant as it will form a clump over time. Botanical Name – Begonia fuchsiodes. 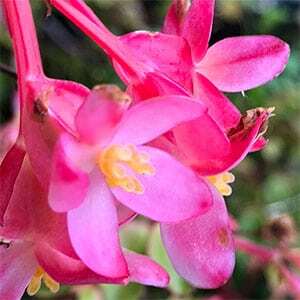 Common Name – Fuchsia Begonia. Soil – Well drained, humus rich soils. Spread – To around .3 metres. Flowers – Pink to red. Flowering time – Spring to summer and autumn. Specialising in Rare and Unusual Peonies (American, Chinese, Japanese, Herbaceous & Itoh) and Brugmansia's. We also sell (hard to find) plants and bulbs.